“Autistic Child” Street Sign; What Are Your Thoughts? You are here: Home / Resources / “Autistic Child” Street Sign; What Are Your Thoughts? As I was driving home from our monthly Rockin’ 21 party tonight I passed this interesting street sign in the middle of a large subdivision. The bright yellow street reads, “Autistic Child“(people first language?) and pictures two children playing on a see saw. There was also a matching street sign across the street from this one. I can see pros and cons of having a sign like this in front of your house. 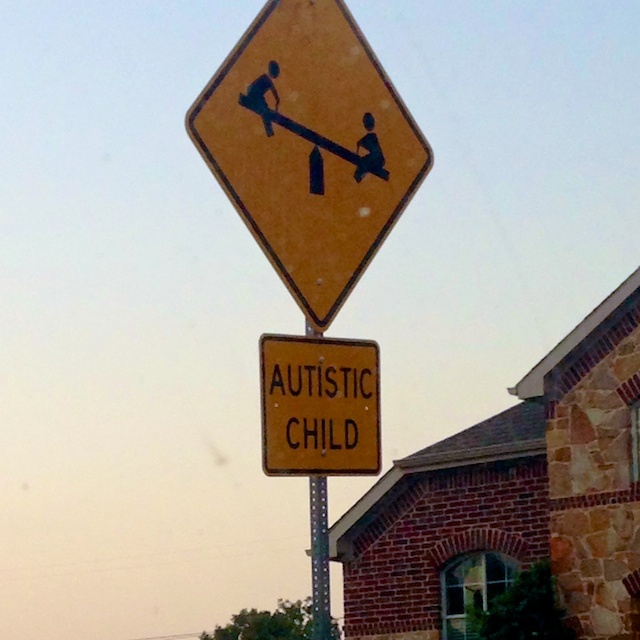 What are your thoughts on the “Autistic Child” Street Sign? Leave a comment below and let me know. It’s no different than the signs for a deaf child in the area. We had this sign on my street growing up. While I do understand how it might make some people uncomfortable, that’s the point! A street sign is to alert people out of their comfort zone. For example, a road is a road until you see a sign saying it is a one-way street or an Interstate. You are suddenly out of your comfort zone. As a result, you tune in your alert senses. I often can’t hear a car or truck coming until they are right next to me. Even with hearing aids on. I do not have a way to gauge the distance of a sound traveling to me (if it is far away or very close). As for an autistic child in the area, seeing that sign tells me, okay, someone has a human condition that I need to alert my senses to. I may not hear the autistic child scream at me but I can keep my eyes open for the autistic child. I may not know exactly what autism is but I know it is a human condition I have to take into consideration with my actions. As for who put that deaf child in the area sign on my street, I have no clue. Everyone in my neighborhood knew about me and always slowed down if they saw me on the street. They have seen me get a little spooked as they drive by because my attention is focused somewhere beside sound. But strangers will see the sign and disregard it as they speed past me without any regards to whether I am that deaf child or not. Many a time I have made a turn while walking or riding my bike only to notice at the very last possible second a car zipping by. And more often than not, those drivers pass by with plenty of room to spare so I can safely stop myself or “freeze”. But not always, especially when there are cars in both direction passing each other by in the same spot I am. Now I am a grown man. I may not be a parent but I am an uncle to two nephews as well as an honorary uncle to many kids. And I still see drivers disregarding signs like these. Not just with kids anymore, but even people in wheelchairs or scooters, and grown adults with human conditoins. I say if the community cares enough to put such signs on the streets, more power to their voice.